Inspiration for my sewing comes to me from some unexpected places, sometimes. For this outfit, it’s mostly coming from the new Wonder Woman movie but also (on a practical level) this month’s Wardrobe Builder Challenge of “Vests, Shorts, Playsuits”. Both inspiration sources have inspired me to get my courage on and try something I’ve formerly avoided – a jumpsuit. 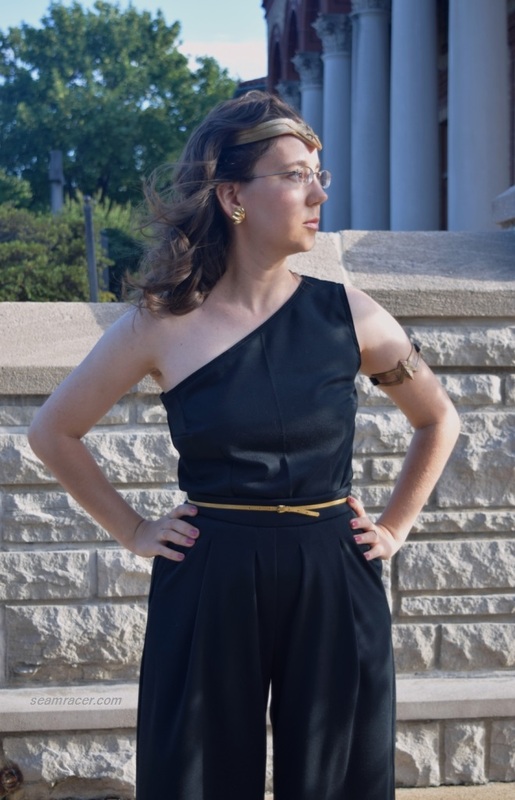 I went all out with my first jumpsuit and chose to make a real statement piece, using a pattern from one of Burda’s designer features, and even sneakily dividing it up so both top and pants can be worn separately to maximize my options. I am quite taken by this outfit! I really get the good and interested looks around me when I wear it. About my main inspiration, there literally hasn’t been anything since the Marvel television show Agent Carter that has had me so excited, inspired, and willing to become entrenched in the culture like the new Wonder Woman movie. If you follow me on Instagram, you might have seen how I went all out when I saw the movie on opening night! What I most admire about Wonder Woman is that her compassion for others only makes her more powerful – and her strength adds to her beauty in a way that has depth and character. Her courage is innate, as is her compassion, so she breaks boundaries and expectations – it’s part or who she is and what she feels she has to do! Her care and concern for others is her driving force, sadly at the expense of herself…much like Agent Carter. That said, a full-out Wonder Woman outfit will be reserved for this Halloween. Until then, I wanted sew something “everyday wearable” to channel the Grecian/Ancient Italian-influenced look Diana had on her Amazon island paradise. What better way to do that than to choose a design from Dimitri Panagiotopoulos, a half Greek and half Italian designer who founded his label in 2007, featured in the Burda Style April 2017 magazine. He lets the heritage of his culture influence his lovely designs, and his styles are meant to evoke strength and confidence in a feminine way. 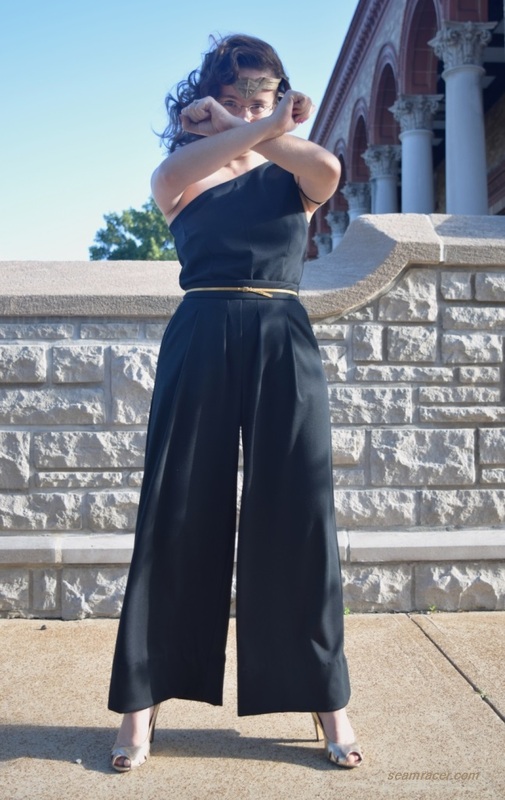 I love how this jumpsuit is so glamorous, bold, yet relaxed all at the same time. This jumpsuit does take a certain courage and self-assurance to wear, I’ll admit, which can be kind of hard but is also empowering. What a perfect design and designer to sew a modern day ‘Diana’ outfit! 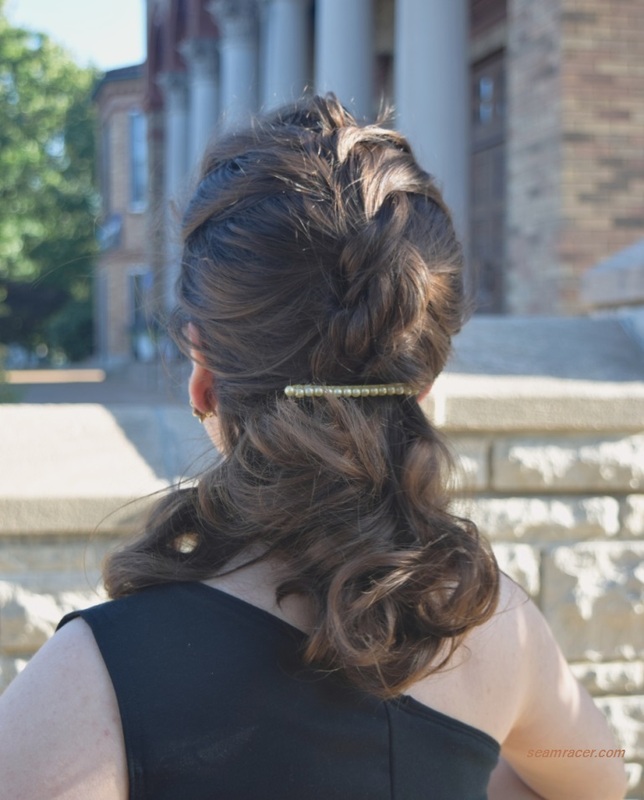 All it needed was my Wonder Woman armband and head crown to complete the Grecian and DC influence! I will revert to the fact my son wanted me to buckle and buy the armband and headband set because he now sometimes calls me Wonder Woman…what can I say, I’m soft. Not to brag but I do think I somewhat look like her put together like this! I wanted to slightly call to mind the 1970s jumpsuits as well by wearing my Grandmother’s nice Trifari brand vintage jewelry (jet cabochon necklace and palm leaf earrings) with my sling back, peep toe, gold Chelsea Crew heels. I’d like to think of my vintage gold belt as an adapted Wonder Woman “truth rope”. FABRIC: a semi-thick and tightly stable poly-cotton-spandex blend Ponte knit. NOTIONS: I had to buy the invisible zipper, but everything else (the thread, interfacing, and hook-and-eye) needed was on hand. As to the sewing part, it was really pretty easy to put together, the biggest challenge came from the pattern running so generously large. I had to take out about 2 inches overall from the side seams of both the top and pants. I drafted out the size that I always use in Burda Style patterns so it must have been the pattern. I remember this problem with the other Burda designer patterns, so I’ll make the assumption that these generally run large and go down a size from now on. My changes were small. First off, I added an extra 5/8 inch to the top bottom hem as I was not going to sew it into the pants but keep it as a separate top. I did also have to add a small ¼ inch bust dart coming off of the neckline on the right side to shape the sleeveless side. I made my own bias banding to finish off the neckline edge with a small rolled decorative edge, but merely turned under and double stitched the single armscye’s seam allowance to keep that low key. I also was able to eliminate the need for a zipper in the top since I was using a knit and making a separate top. The pants have very full pleats together with handy pockets, making these comfy but something that makes me self-conscious. Pleated pants are somewhat hard to like looking down at myself, I feel fat even though they are in a slimming black and do look good when I look at them in a mirror or picture. Oh well! At least I am proud of another well done, truly-invisible invisible zipper in the side! Even though a knit-friendly interfacing seems to be recommended for the pants waistband, I went with a thick and stiff interfacing to support the heavy pants and stay the pleats. I thought a gathered back to the pants like the design calls for was a bad idea, both for my taste and for the rest of the outfit. So I merely made a duo of pleats to the back fullness, instead. I figure I can always turn the pleats into darts if I want in the future. Please forgive the folds and creases in the fabric of my jumpsuit. I cannot use a high heat on this fabric and the on-the-bolt fold seems like it is set on permanent press. The fabric is so supple and flowing, those unwanted fold lines are just something I have to live with for now, just wanted to let you know it’s not like I didn’t try. I see a lot of possibilities with this outfit. After all, a pair of black pants goes with anything! 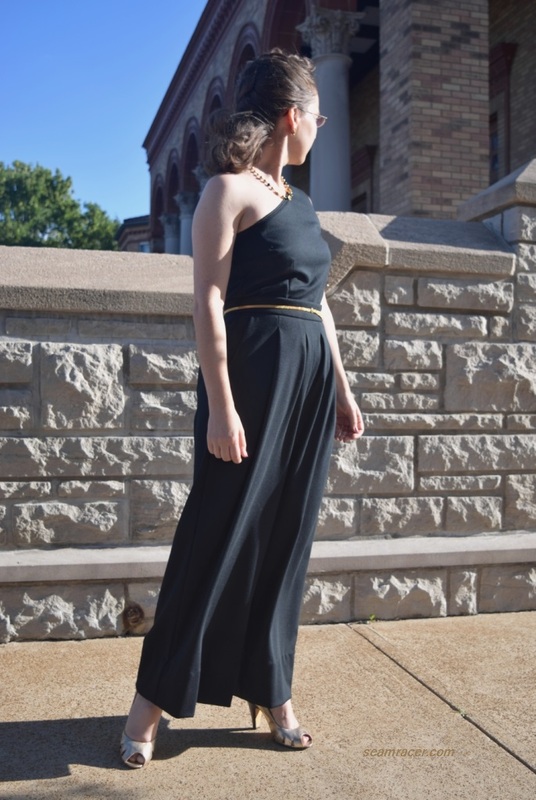 The one-shouldered top half (whether worn with or without the matching jumpsuit bottoms) pairs well with the other one-shouldered Burda shirts (post here) that I made a few years back now. Find the courage to try that new kind of garment to wear, as well as finding the Wonder Woman type of courage to do what is right. Be strong. Have compassion on yourself and others – we all need to feel awesome and cared for. Let some of this carry over to your life and even sewing (why not?) for a truly wonder-ful result! 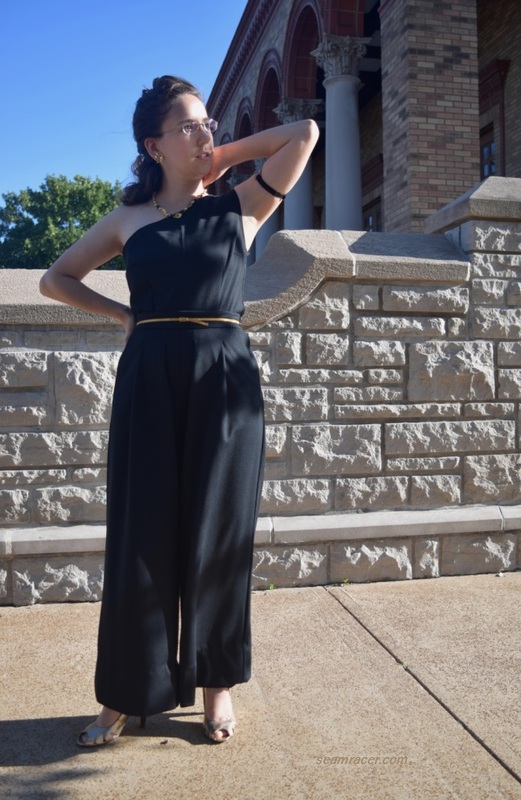 This entry was posted in 1970's, Modern and tagged Burda Style, Burda Style patterns, Dimitri Panagiotopoulos, jumpsuit, knit, knit jumpsuit, one shoulder jumpsuit, retro, separates, sewing, vintage by kellycb. Bookmark the permalink. Thanks, Quinn, it’s always so nice to get encouragement! Yaaasssss! You look fabulous. I loved Wonder Woman so much, and this is the perfect tribute. The jumpsuit turned out so well, and the pieces are so mix and match-able! The pants would probably work quite well as 40s trousers too! Also, a gathered back to pants? What was he thinking? Your solution was fabulous! Thanks! Sending out a happy hello to a fellow Wonder Woman enthusiast like me! I do feel awesome wearing this jumpsuit set – its like some sort of power outfit. I’m especially glad to hear you also think the pants remind you of 40’s trousers…they did for me but my hubby told me no, and I didn’t end up saying anything about it in the post. And, yes – and much as I like the design, a gathered waist over the bum is unthinkable. I keep reaching for these pants and love wearing them – they feel like comfy sweatpants and as my first and only pair of black pants they are now indispensable. 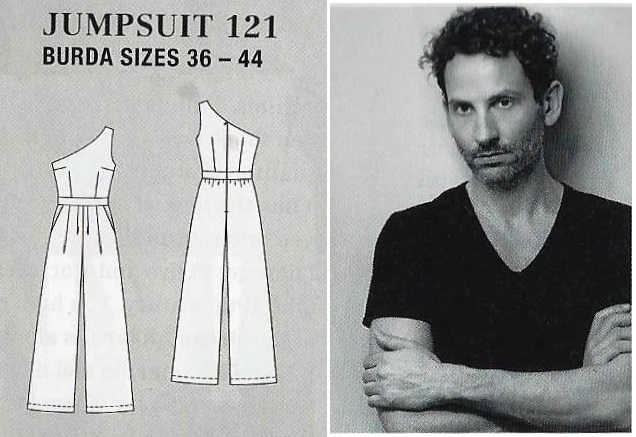 I’m making this jumpsuit now and I’m a bit confused about the instructions for the pocket facing piece–do you happen to remember how that fit into the whole pocket setup? It seems totally unnecessary and like i’m going to end up with this weird extra flap, so I feel like I’m missing something in the construction! The instructions seem to have you sandwich it into the seam between the front trouser piece and the pocket lining. p.s. yours is great–wish I had had the foresight to cut the top part longer so I could have done separate pants and a top too! It’s been awhile since I’ve made this now, so I’ll do the best I can to explain the technique! The pocket facing is the other half of the pocket, which hangs free inside the pants (unseen) connected only at the side seam and waist. By sewing the underside of the pocket facing inside and bringing the rest of the pocket flap away from the side seam, it keeps everything in place so you end up with only a subtle opening over the hips. I hope this helps! If you have any other questions, ask away!